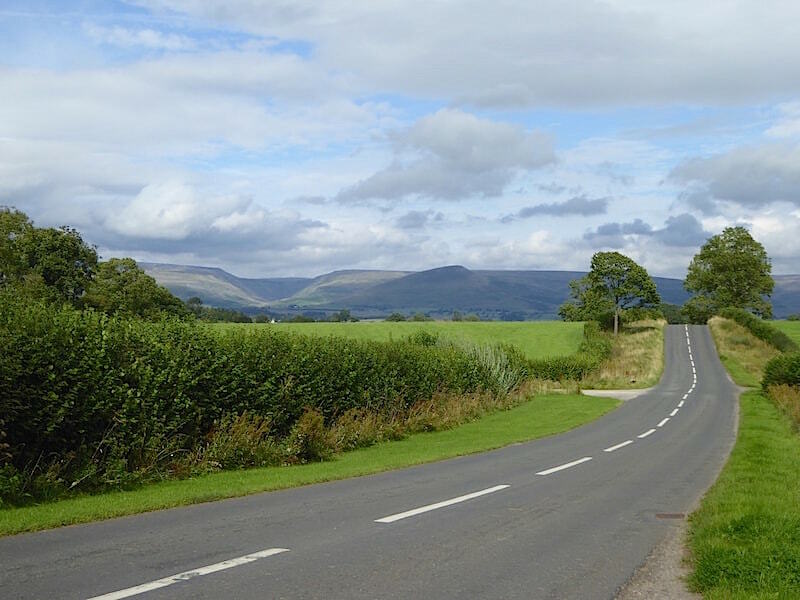 Having seen the huge volume of Bank Holiday traffic crawling off the A6 and M6 onto the A66 on Friday we decided we were not going to add to the general bustle and inevitable overcrowding by taking a walk on any of the Lakeland fells this holiday weekend. 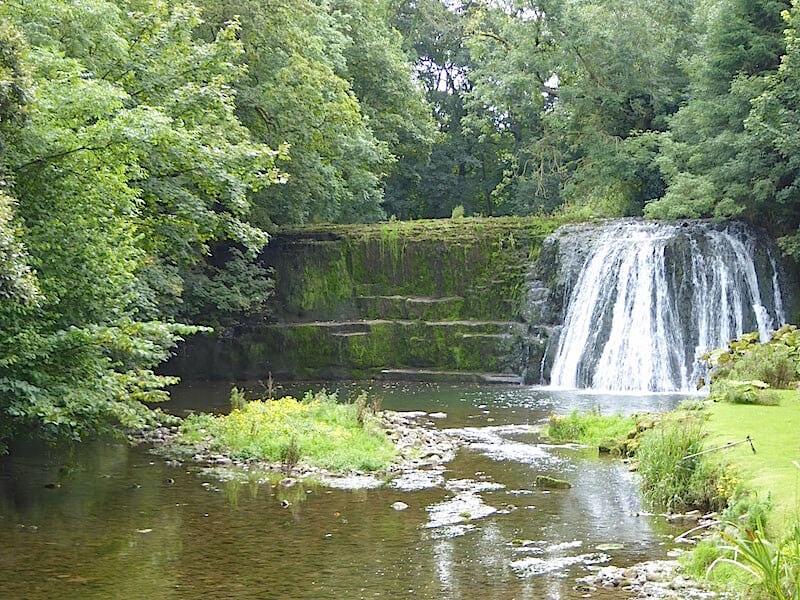 Instead we opted for another of the walks in Vivienne Crow’s ‘Walking in Cumbria’s Eden Valley’ guide book to pay a visit to Rutter Force. 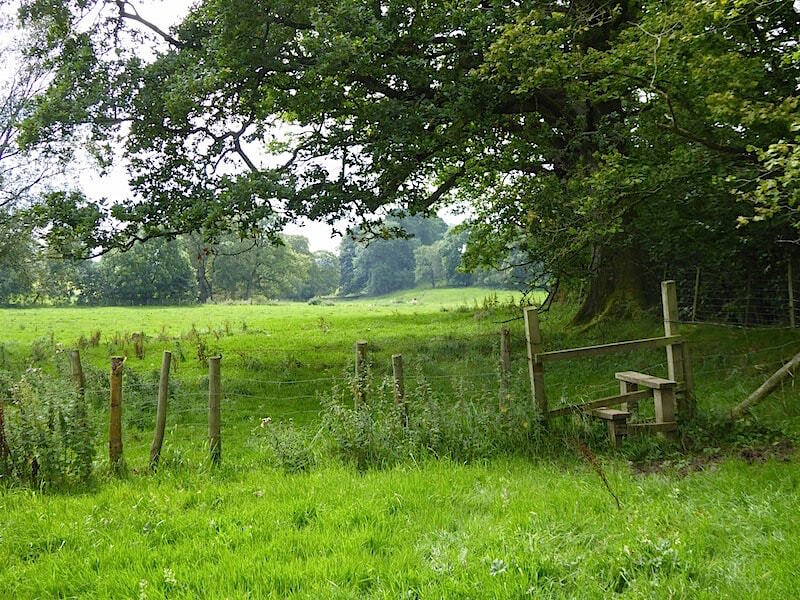 This is an easy, low level walk through gentle countryside and was just the thing for a peaceful walk on a sunny Sunday afternoon. 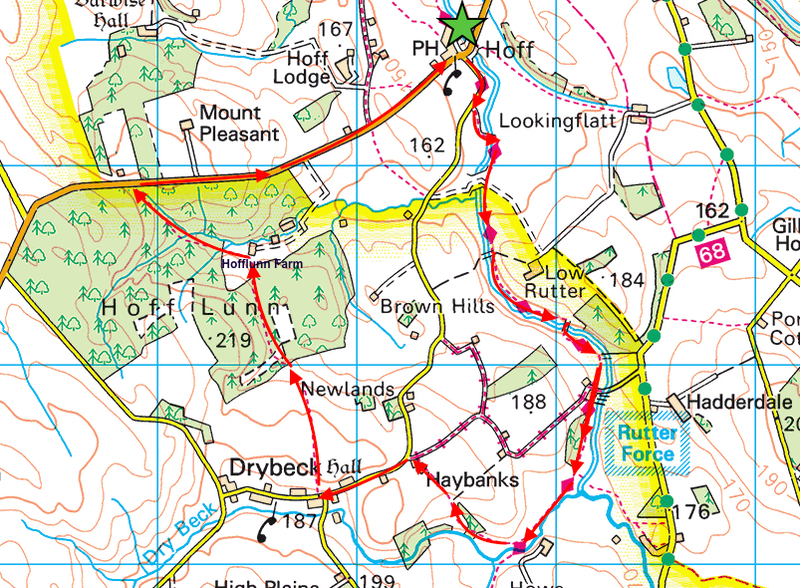 An added extra being that it is only a drive of ten and a half miles, along traffic free back roads, from our front door to that of the pub in Hoff where the walk begins. 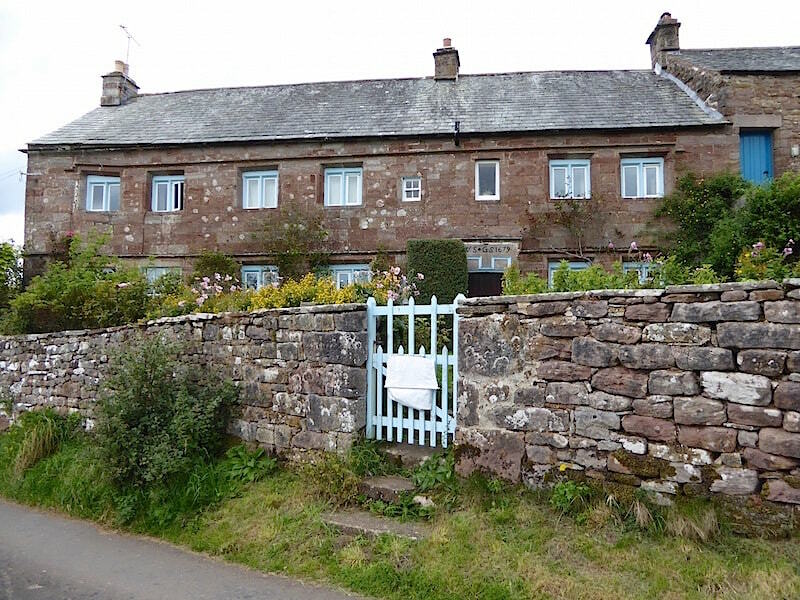 The walk begins at the start of this lane, opposite The New Inn, in the tiny hamlet of Hoff. There’s a small car parking area, for about three or four sensibly parked cars, just out of shot on the left. 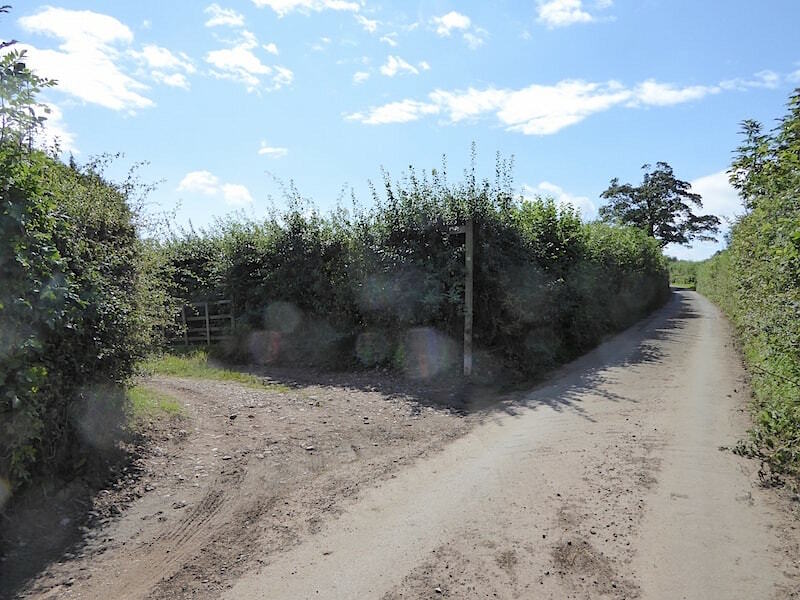 We have Hoff Beck gurgling away on our left as we walk down the lane for a few yards before …..
….. turning off along this track to the left by this signpost. 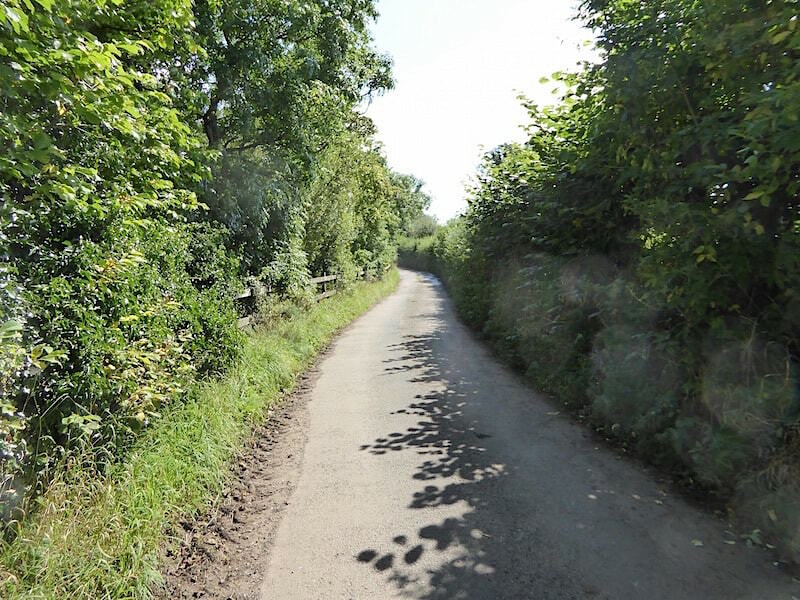 The lane carries on to Drybeck, another small hamlet, which we will arrive at towards the end of the walk. 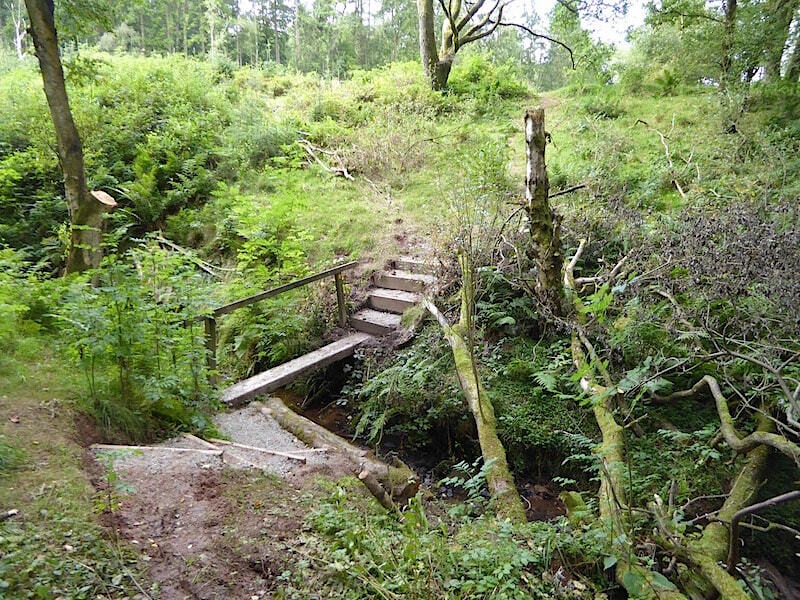 A short distance further along the path and we make the first of several bridge crossings over Hoff Beck. From the bridge crossing we walk through a series of fields during which we were joined by another group of ramblers who tagged along behind us. 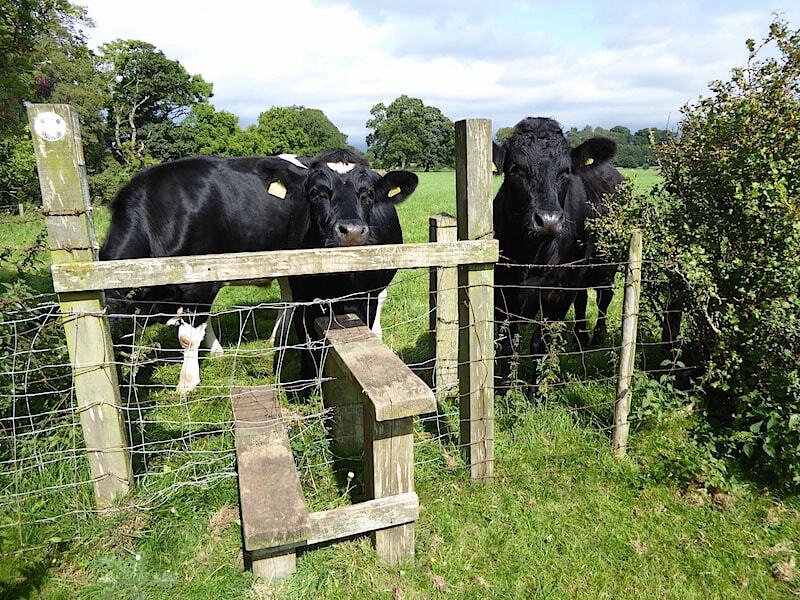 Unfortunately their stile climbing skills were not well developed and so we said our goodbyes and parted company with them as we crossed the first of a large number of stiles. 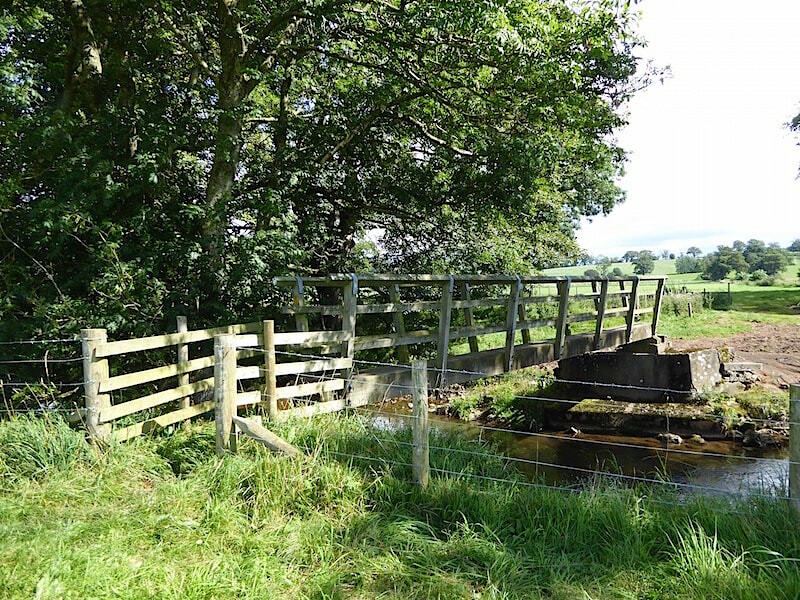 No need to cross back over this bridge as this is just a beck crossing point for farm vehicles so we carry straight on across the fields. 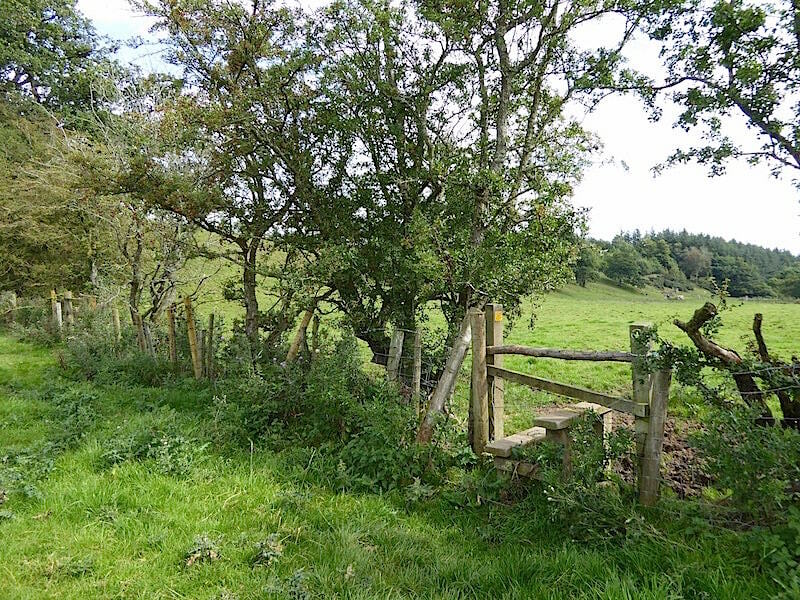 Stile 2 – somewhat superfluous since there was no fence attached to either side of it. 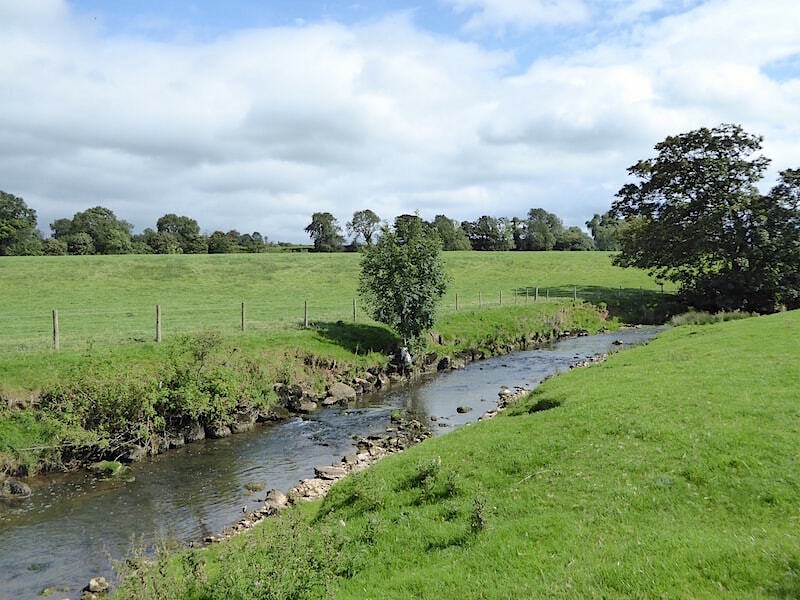 A lovely stroll along the banks of Hoff Beck in the warm afternoon sunshine. 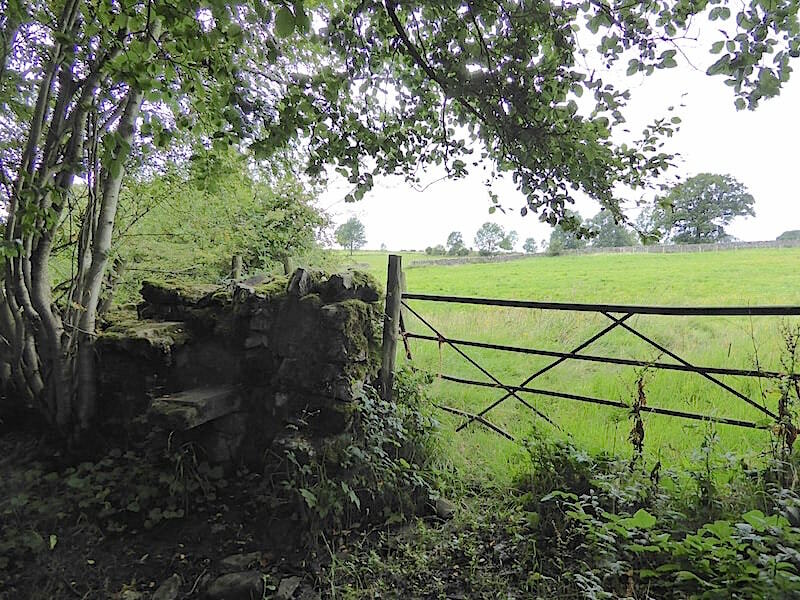 Stile 3 – there’s a gate further along the fence but it was securely fastened, as were most of the others along the route. 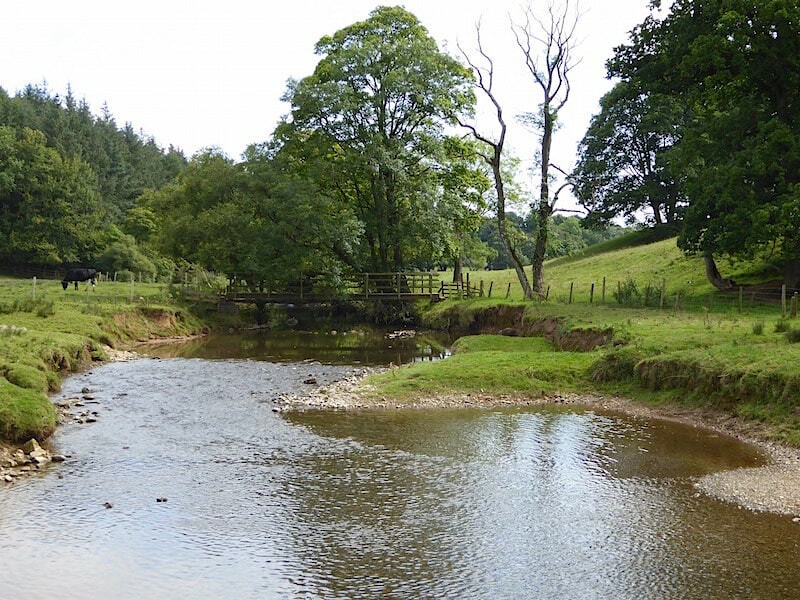 The beck has widened considerably here and ahead of us is another bridge which we must cross to continue on the path on the other side of the beck. 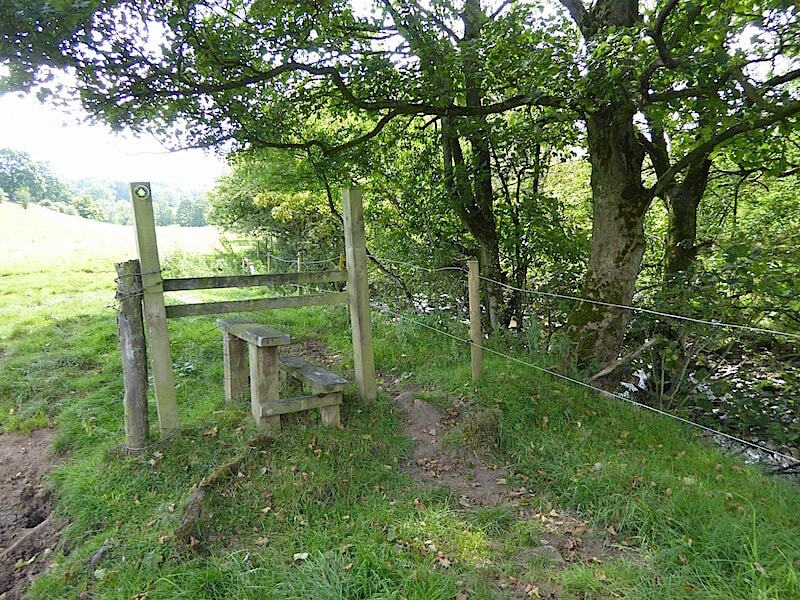 Over the bridge we go, at the end of which was stile number four. 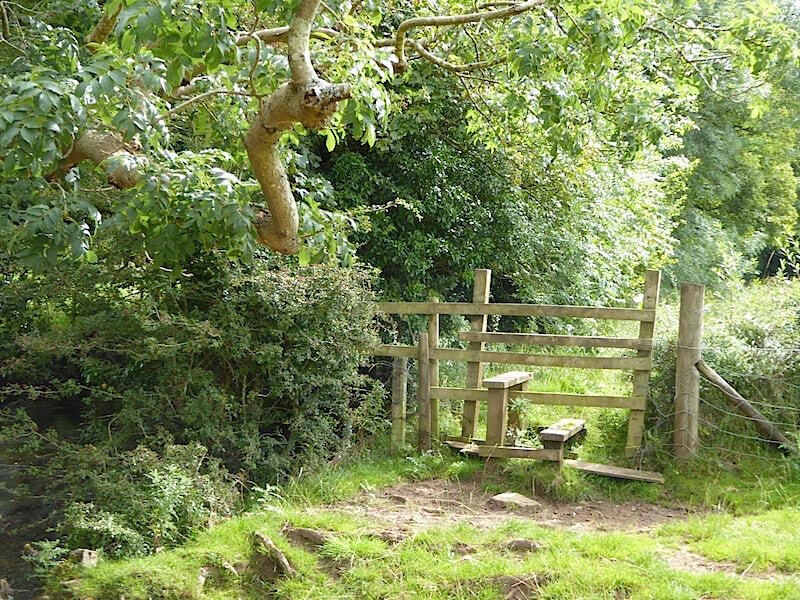 Just as we’d crossed the stile we met two other walkers who were now negotiating it as I took a look back. 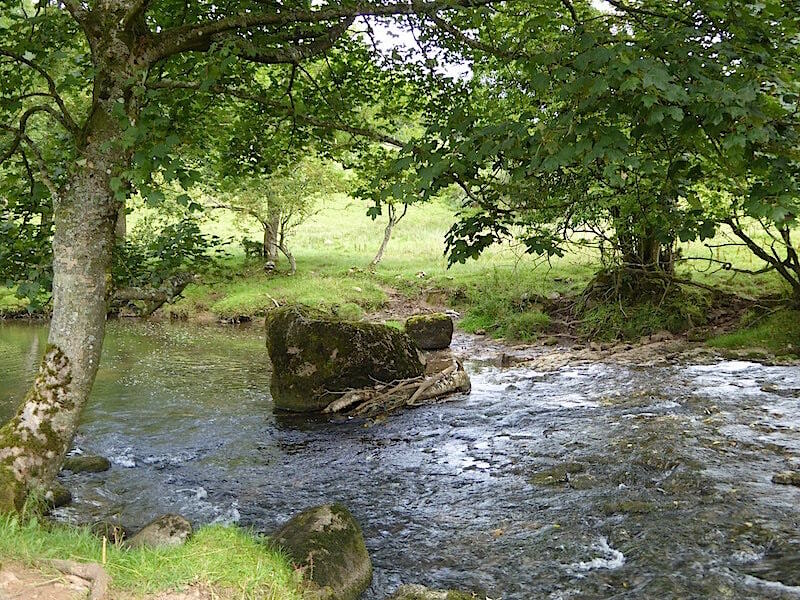 A large boulder in the middle of the beck indicates that we are still on the right track so its on to …..
Stile 5, beyond which we were confronted with …..
….. a very tall and dense mass of bulrushes with the path going straight through the middle of it. 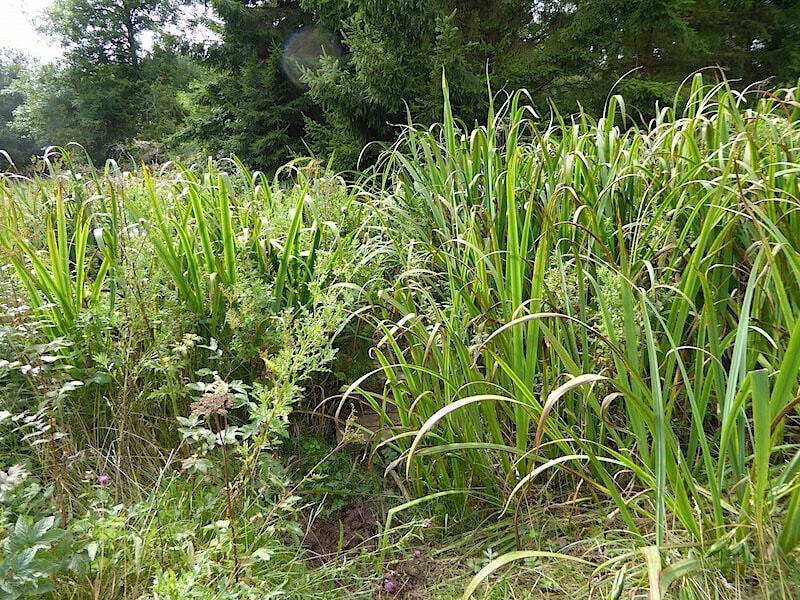 As we elbowed our way through thoughts of Moses in his basket sprang to mind, how the heck did the Pharoah’s daughter spot him in vegetation this thick? Always supposing that the story is to be believed, of course. For me it was an entertaining Sunday School story after which I remember spending quite a while wondering what a Pharoah was! 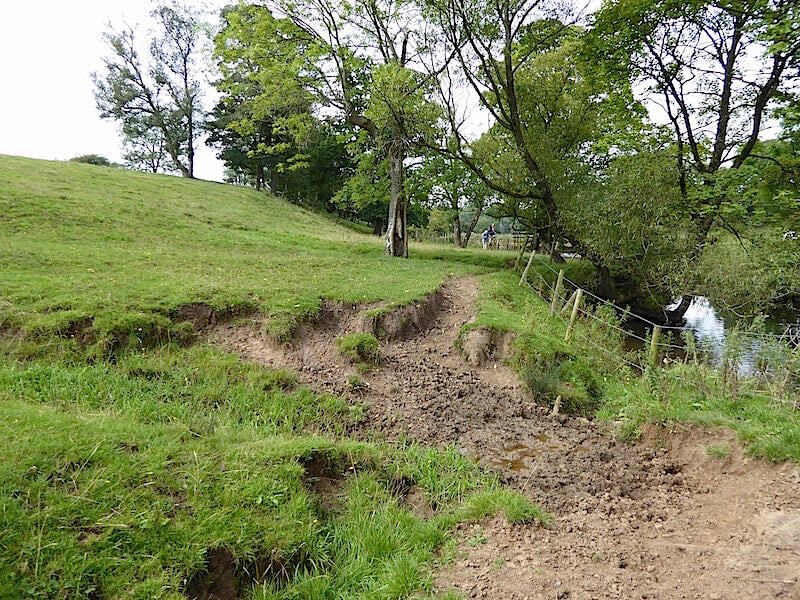 The path eventually led us out onto a narrow surfaced lane which continued on around the bend and fords the beck at Rutter Force. 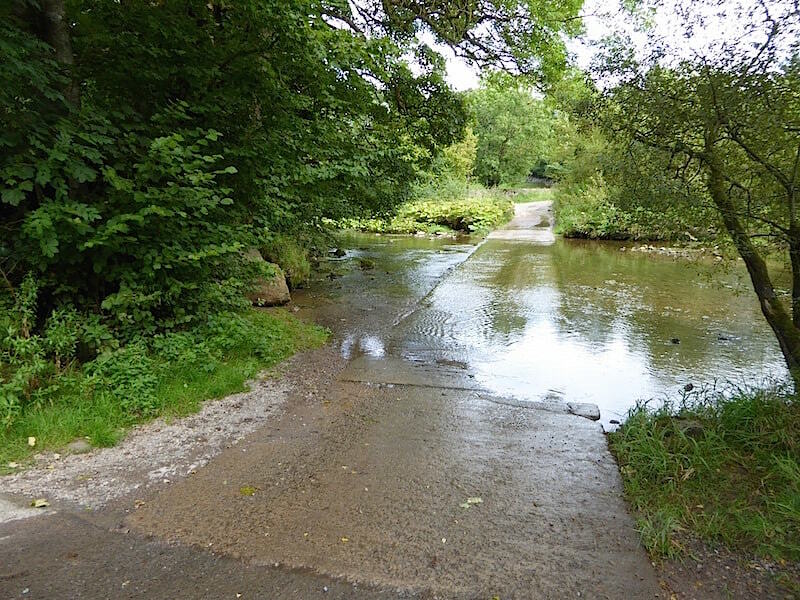 It was a little too deep to walk over so we used the bridge which is just out of shot over to the right …..
….. from which we had a view of this picturesque pastoral scene of Rutter Force and the old mill. 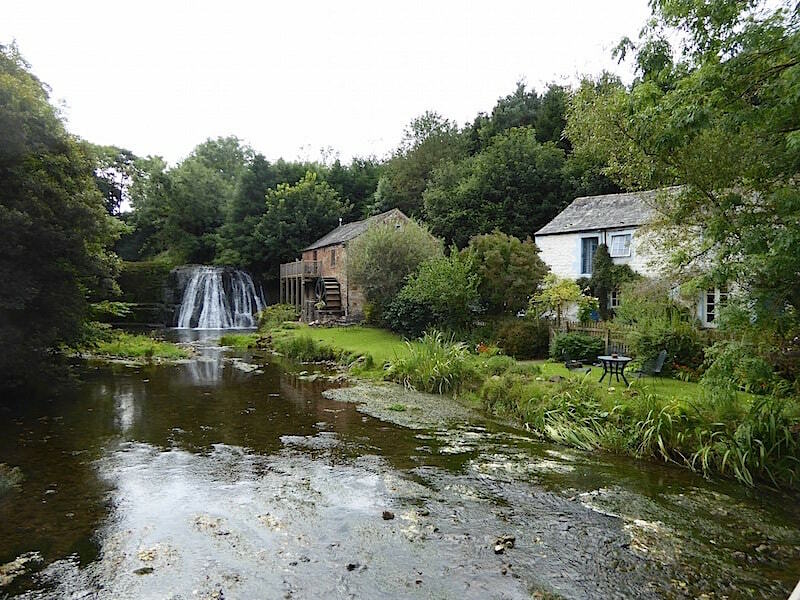 The mill is no longer a working mill, having been converted to holiday accommodation, and the original waterwheel was removed in 1940, The present wheel is only a replica. 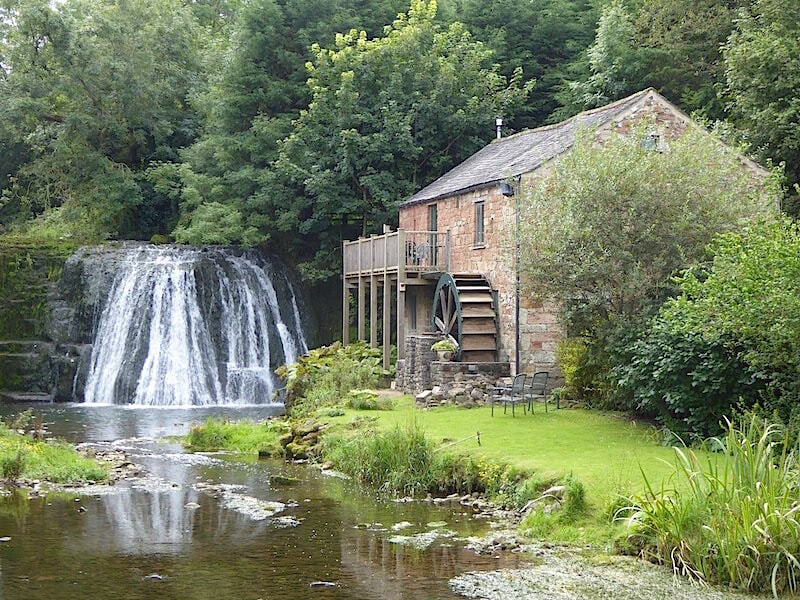 The earliest record of a mill at Rutter Force dates from 1579 when the water was used to power a corn mill. 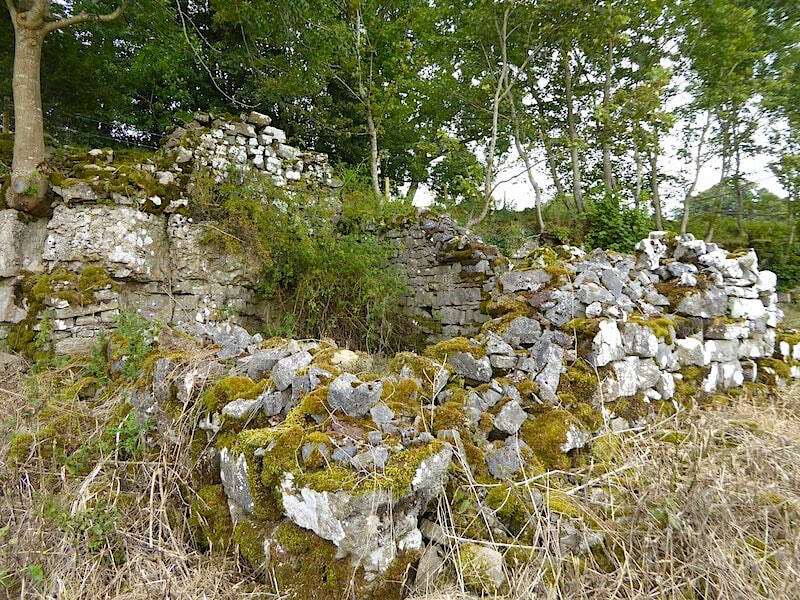 That continued until 1832 when it was converted to serve as a bobbin mill and, later on, a sawmill. It also played a part in bringing electricity to the area when a water turbine was installed in 1928 using the 30′ falls to produce electric power. 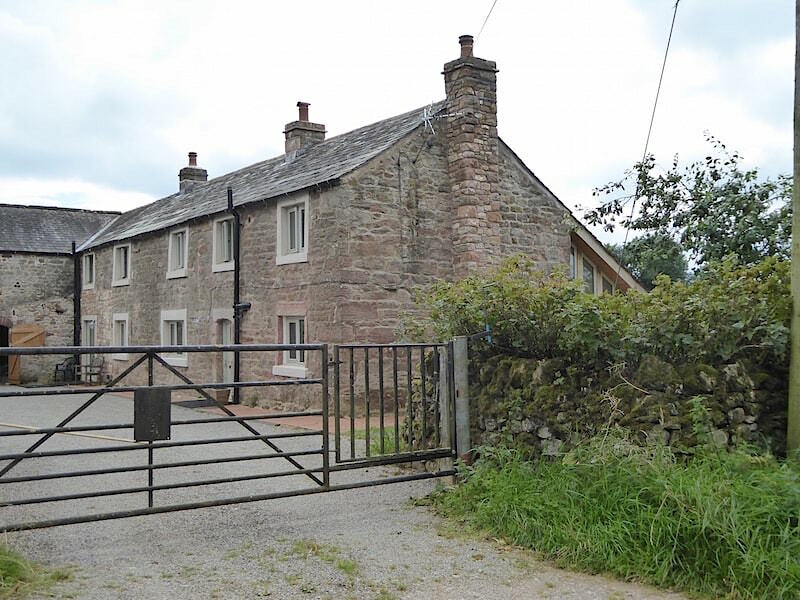 Power lines were installed to the parish church and chapel, local houses and farms, and illuminated the solitary village street in Great Asby and it was the only source of electricity for the area until the National Grid reached it in 1952. Its a beautiful and idyllic place on such a lovely sunny day. 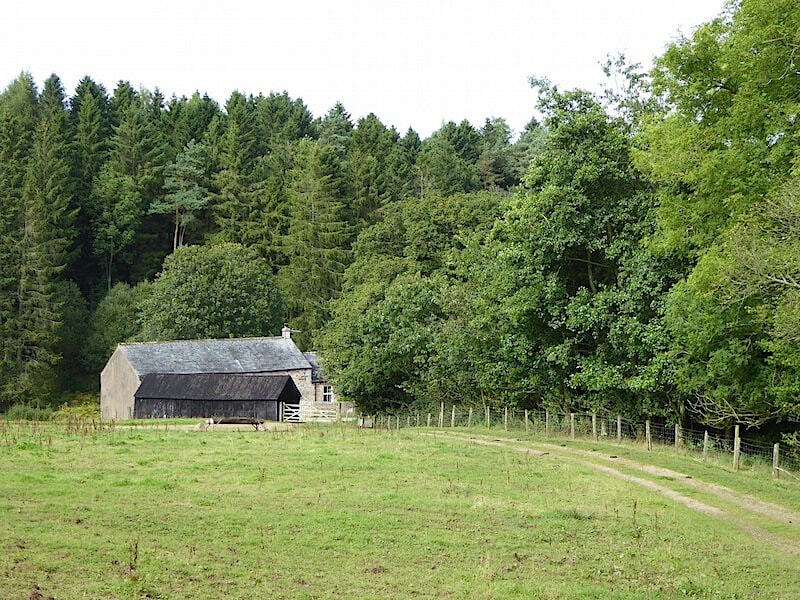 We retraced our steps back to the lane and followed the footpath up a slight rise and round the back of the mill where stile 6 was waiting to the clambered over. 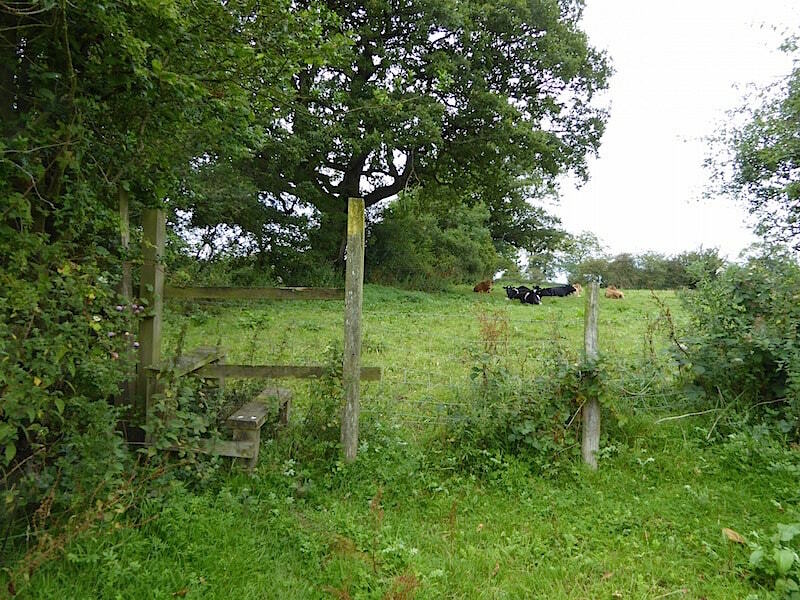 We continued along the beckside …..
….. and then swung away from it across the field to deal with stile number seven …..
….. across to another well secured field gate with stile number eight set in the wall to the left of it. 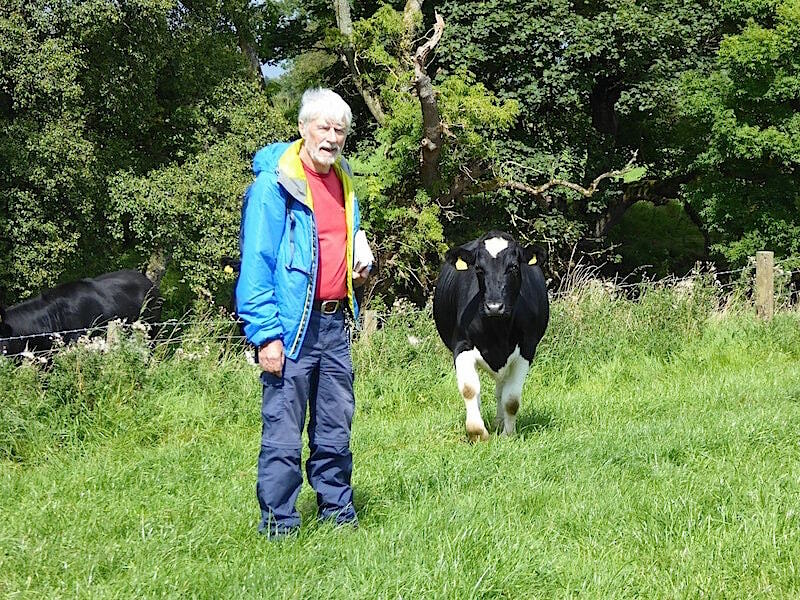 As we crossed the next field and headed towards the gate two friendly locals wandered over to say hello. We didn’t have any Polo mints but they were happy to accept a couple of handfuls of grass. 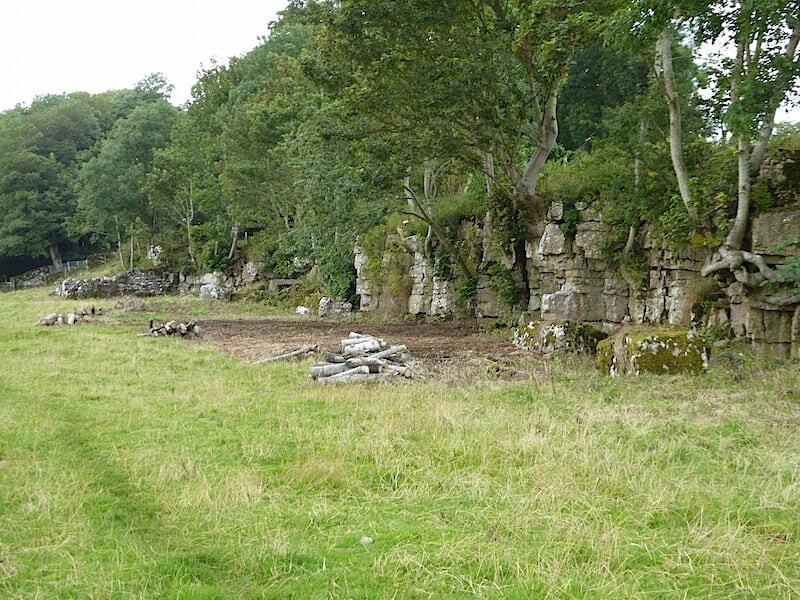 The gate wasn’t locked so no stile to deal with, and the path led us alongside these old quarry workings …..
….. with this long derelict old quarry building towards the end of the workings. 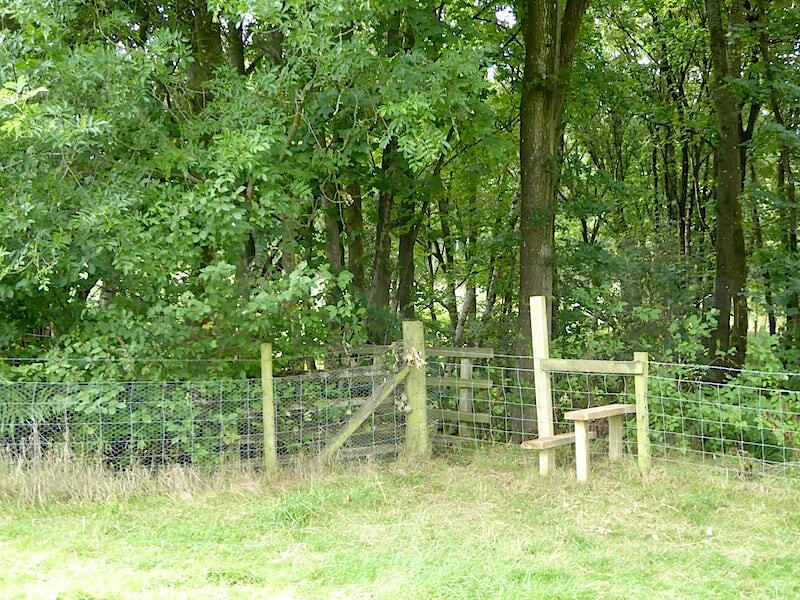 No stile in the fence at the end of the quarry workings and once through the gate the path swung up a slight rise through woodland. 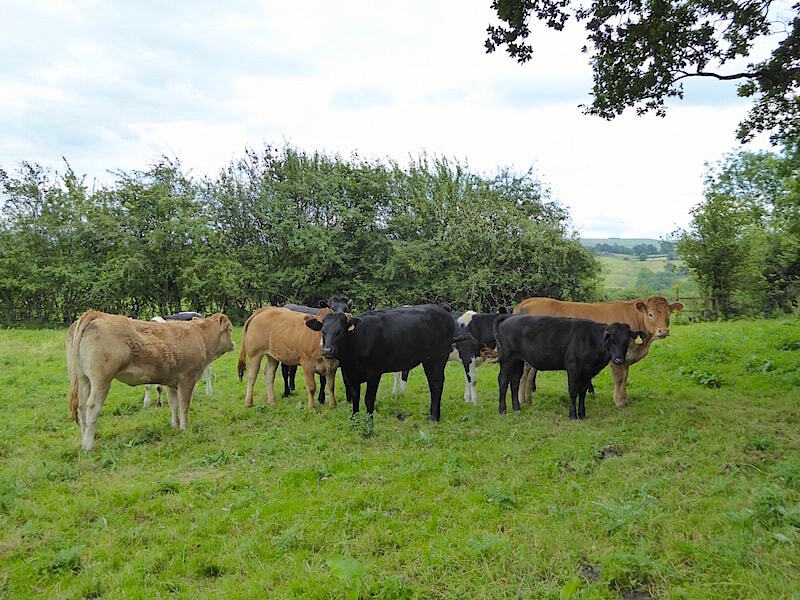 After about two hundred yards we have to gain access to the field path using stile number nine …..
….. and at the end of the field is stile number ten, beyond which a small group of young calves were sitting down enjoying a lazy afternoon …..
….. until we came along and ruined their solitude. They obligingly stood up and moved away as we approached and gave us some very baleful stares as we left them behind. 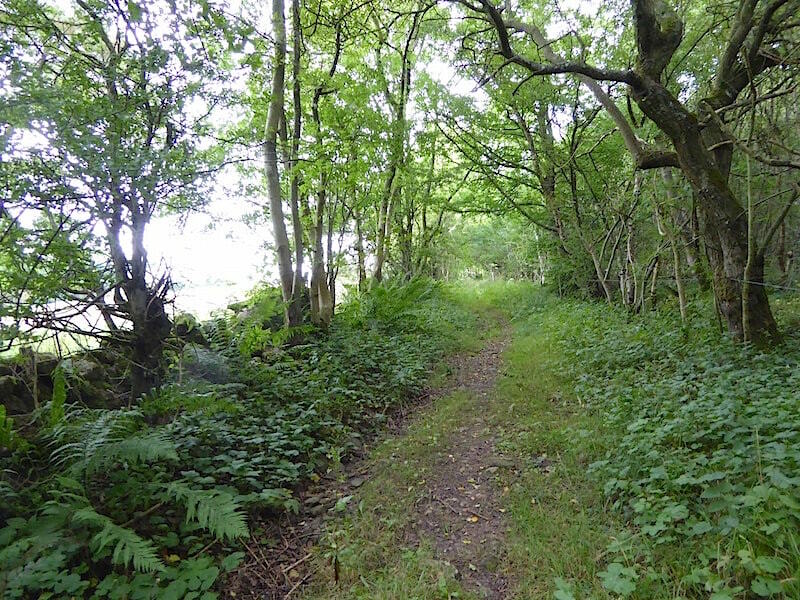 Beyond the calves the field path culminated at Haybanks Farm from where we had a short stretch of lane walking down to ….. 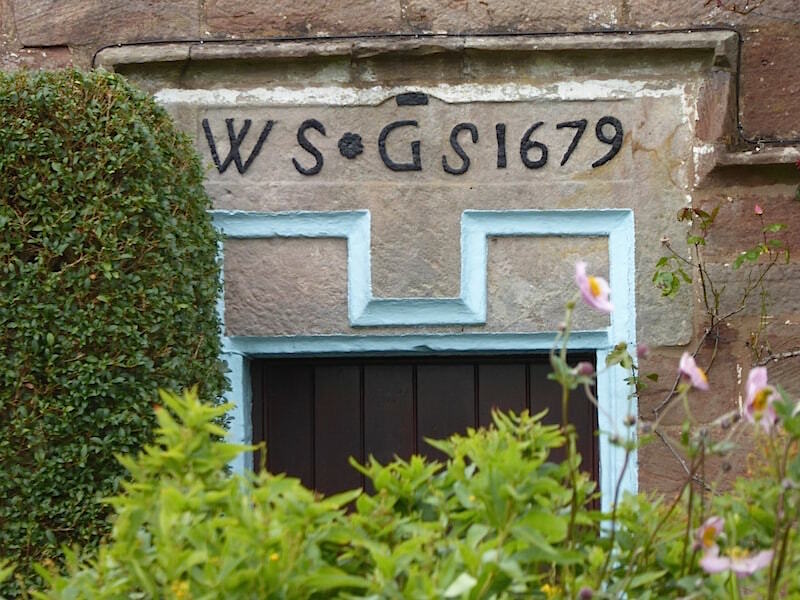 The date stone over the door giving the initials of the owners, or builders, of the hall at the time. 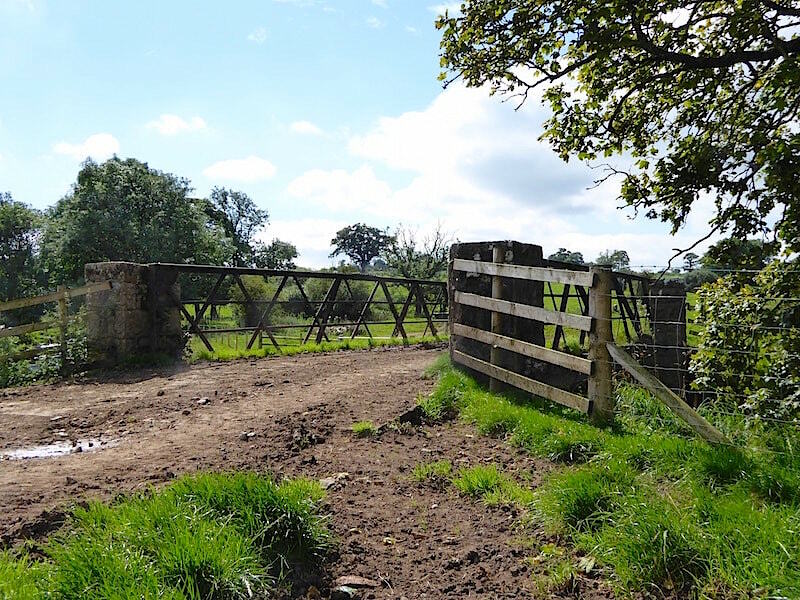 We walk down the hill from the hall into the hamlet of Drybeck, where we take an immediate right turn up through a gate and across the fields above it. 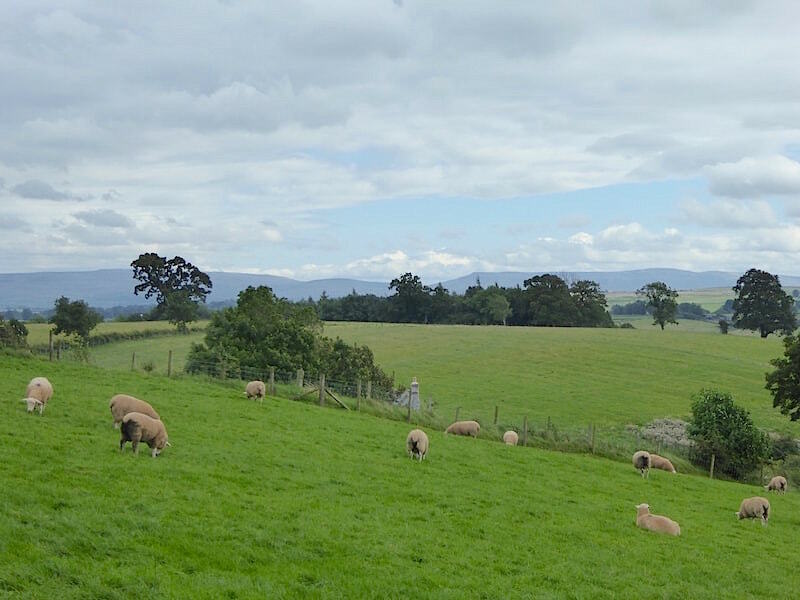 The North Pennines now beginning to show as we gain a little height. 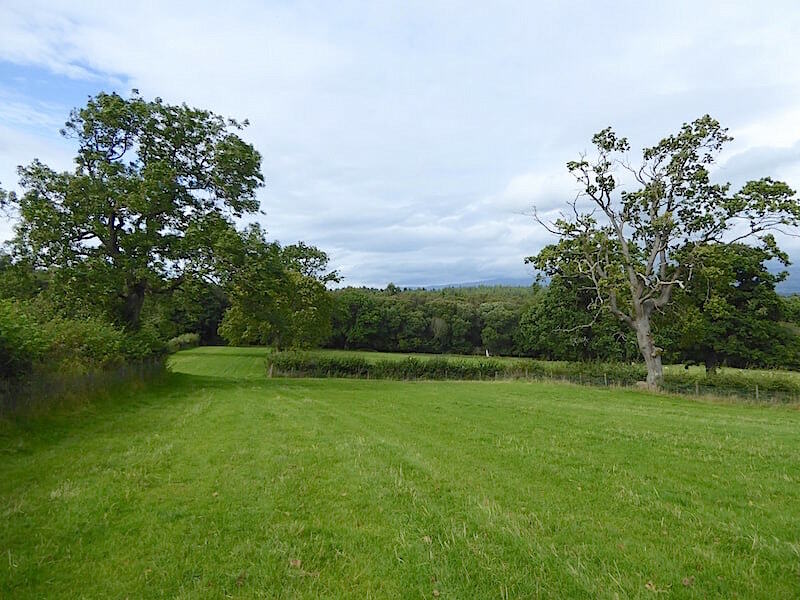 From the crest of the rise the land drops down to join an area of woodland, known as Hoff Lunn. 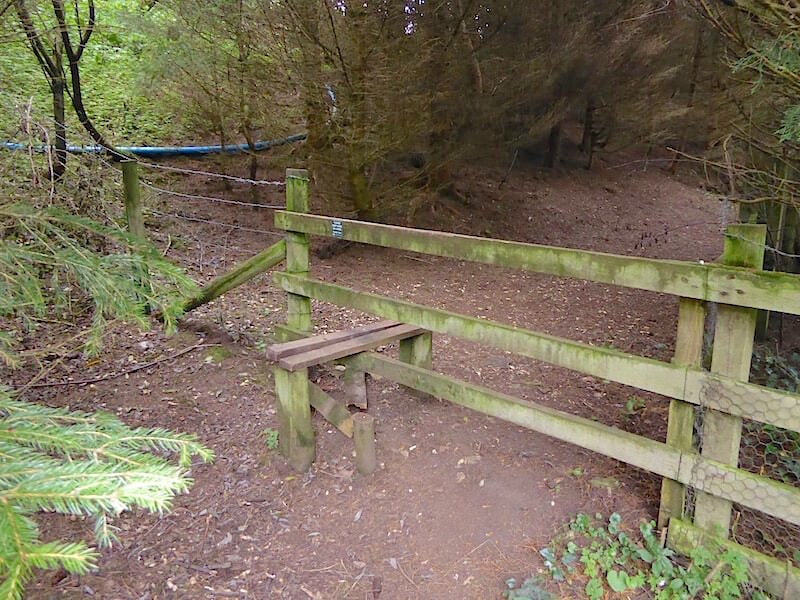 Before we enter the woodland stile number eleven is waiting to be crossed, and immediately to the left of it is a narrow bridge across a small beck. 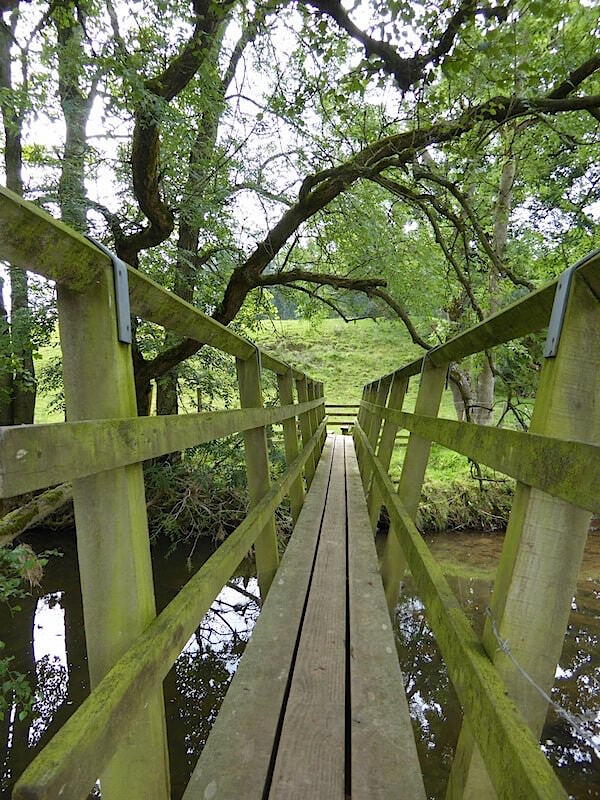 Over the bridge and the path curves to the right and drops down to this plank bridge across another small beck. Over the bridge and up the embankment where we emerge onto a wide, flat and mostly grassy path between trees on our left and a fenced area on our right. This is a pheasant breeding area and there were large numbers of them running around on the various tracks leading off the main pathway. The blue and red bins are full of seeds and the birds just help themselves via a wire dispenser at the bottom of the bins. 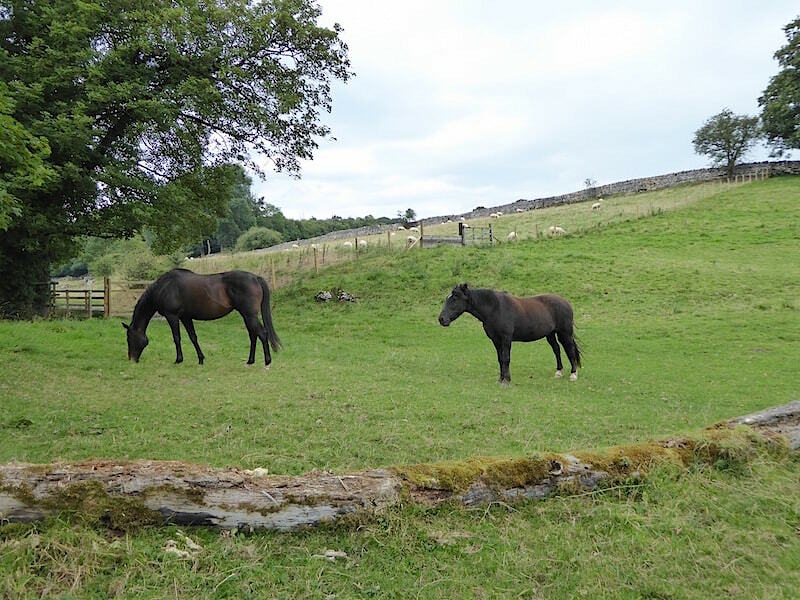 They are bred for shooting, the shoots being run by the owner of Drybeck Hall. 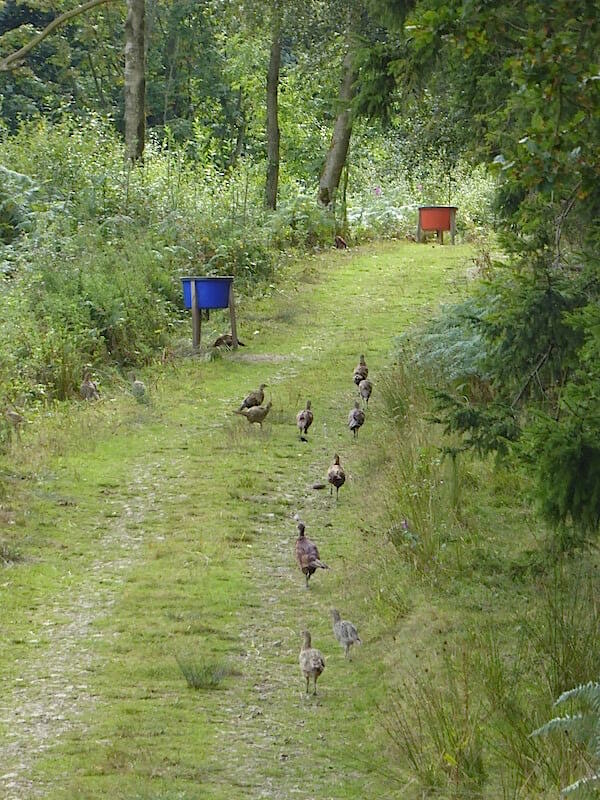 With the pheasants scurrying along before us we continue on through the woodland with the track eventually leading us out of the wood and curving around down to Hofflunn Farm. 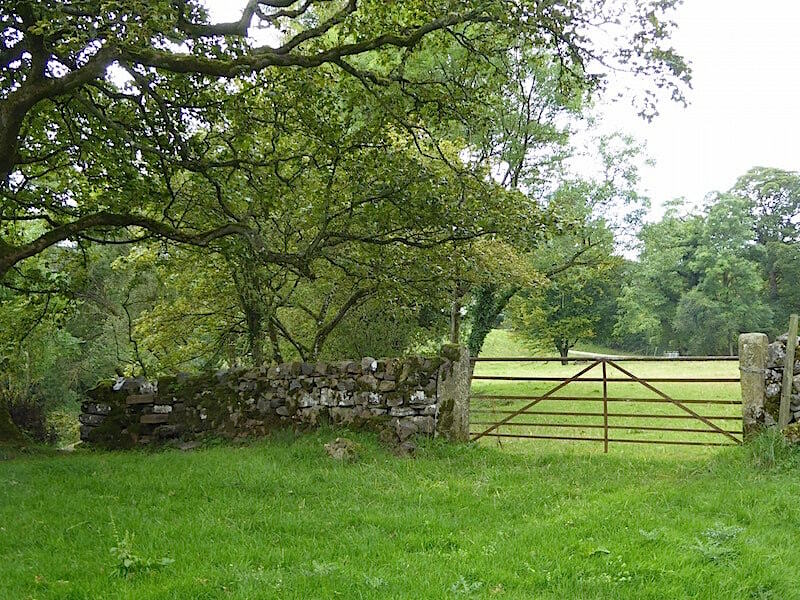 From the farm the track drops down to re-enter the woodland where stile number twelve awaits us alongside another locked gate. 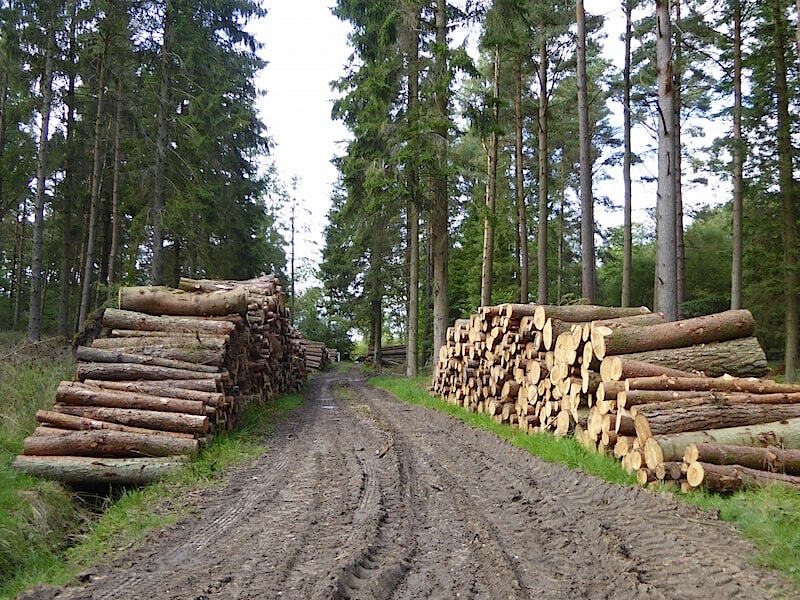 Carrying on through the woodland and then into an area of very tall conifers where logging has been taking place. The logging vehicles have churned up the track quite a lot but it was mostly dry so there wasn’t too much muddy walking to be done. 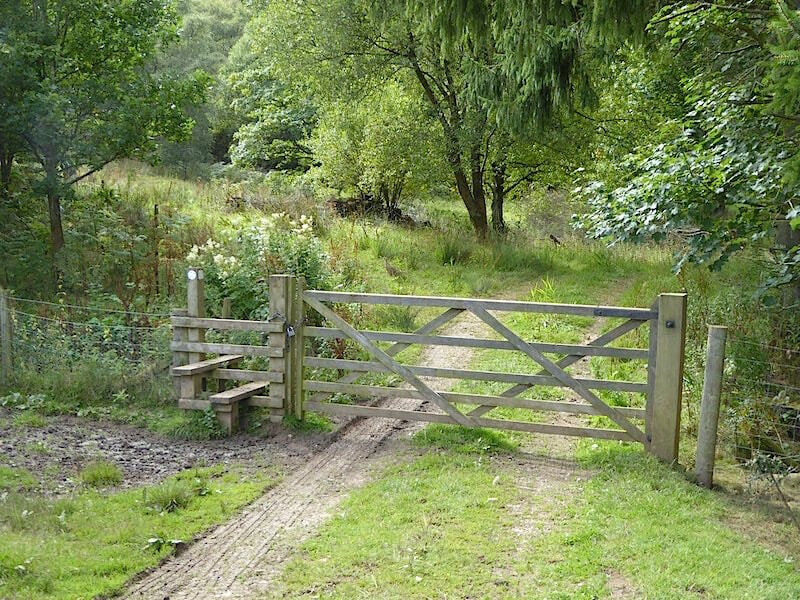 At the end of the track you might just be able to pick out a gate which we knew by now would also be locked so we prepared for yet another stile clamber, only to find that no such stile was available, so no baker’s dozen of stiles for us today then. The wall wasn’t too high and was easily crossed, after which we were back on the road with just over a mile of walking to do back to Hoff. From the road section I took this close up of High Cup Nick, the head of which has the little patch of sunlight on it in the centre of the shot, although its a little on the murky side thanks to the line of cloud hanging over it. 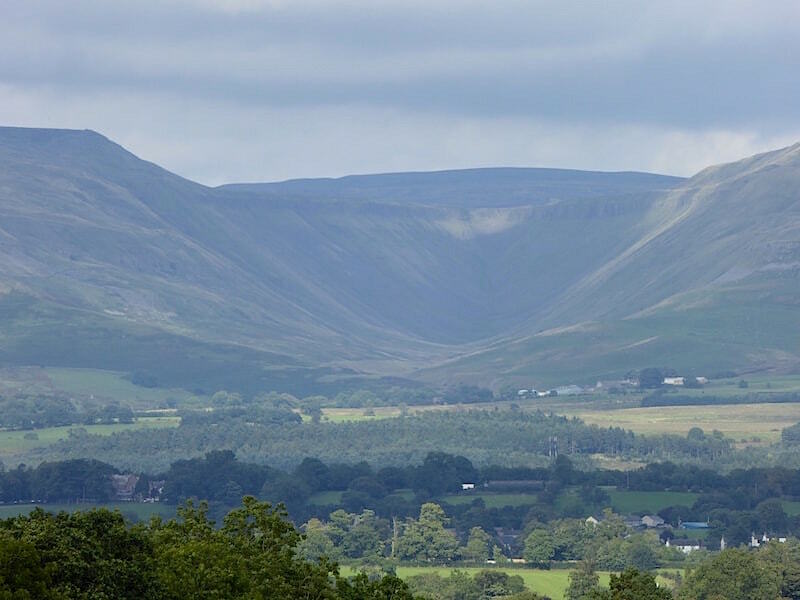 Heading along the road back to Hoff with another view of High Cup Nick over on the left. The road leads on to Appleby and it had quite a lot of traffic on it today so we were constantly having to step over to the side to avoid it. That was fine just here with its wide grassy verges but behind us there were none so it was just a case of stepping into the undergrowth and hoping for the best. 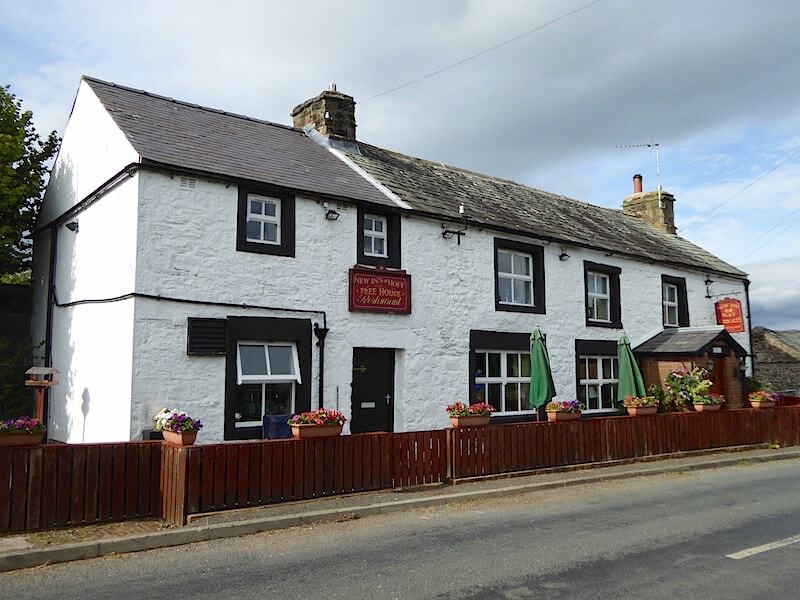 Our walk ends right where it began at The New Inn at Hoff where we partook of a little light refreshment before going back across the road to the little lane where we were parked. 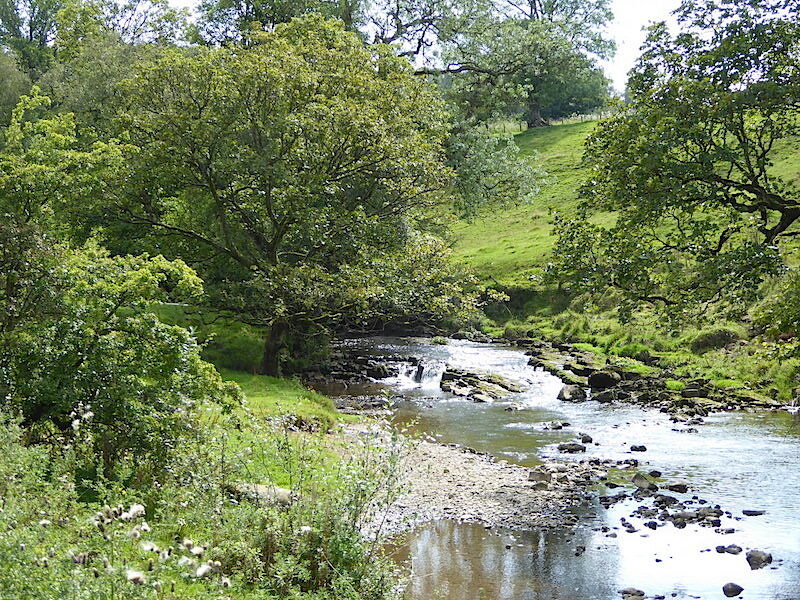 Apart from the last section of busy road walking we’ve had a lovely tranquil afternoon and a grand little walk.